The growing season in my area runs from approximately mid/late-April through early/mid-November; because our last frost date is relatively late in the year, it means that some plants need to be sprouted indoors to give them enough time to grow to harvesting/fruiting size. That means that to make my garden work, I’d need to start few plants from seed nearly two-months before our frost date: the tomatoes, peppers, basil and cilantro are all heat-loving and long-growing plants and need that head start.I was both incredibly excited and incredibly nervous to get my seeds started – this is the first test of my previously-absent green thumb, and if my seeds don’t germinate or if I don’t handle them properly and they die, I won’t have enough time to start over from scratch.To give myself the best chance of success, I decided to follow a system for seed-starting that is both uncomplicated and mostly idiot-proof: the Burpee greenhouse kit. I picked mine up at Home Depot for $10, and although the system is fairly flimsy, it does come with everything you need, and the soil-less peat pellets make planting your seeds clean and easy. I planted three seeds in each cell to help ensure I’d get at least one usable seedling for each type of plant, and planted two cells’ worth of the tomatoes, basil and cilantro because I want to be able to two plants for each. Since I’m trying two different varieties of peppers, I planted one cell of seeds for each. I’ve got sprouts! 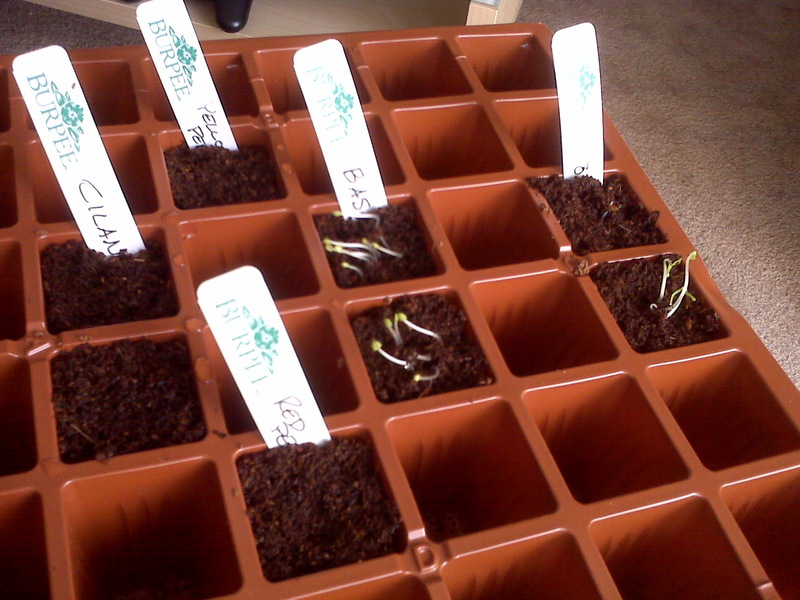 The basil and tomatoes are sprouting nicely, and far earlier than expected. I can’t see any sign of the other plants yet but I feel pretty optimistic. Almost all of the seeds had an estimated sprout time of 8-10 days, so aslong as they start moving by mid-week I should be in good shape. Once they’ve all sprouted I’ll need to set the tray up under a light source – luckily, we have an old Aerogarden that didn’t work terribly well on its own, but has a full-spectrum grow-light built in which I can repurpose for this. I’ll probably need to thin out the seedlings at that point, and then there’s nothing else to do until the seedlings are a few inches high, at which point the tomatoes and peppers will be moved into intermediate pots (peat pots, which can be planted directly in soil and will dissolve over time) and the basil and cilantro will go into their final container. That, however, is several weeks away. For now I’m just happy that I’ve managed to get some of my seeds on their way to becoming full-grown, edible plants! This entry was posted in Gardening and tagged eleven in 2011, gardening, goal #2. Bookmark the permalink.